The Heated Outdoor mat for snow melting. 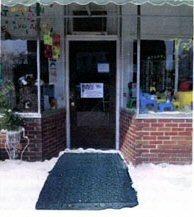 This 3x5 feet BLACK mat with 10 foot cord comes with standard 120 volt AC plug and built in GFCI. The Heated Mat runs on standard 120 volts AC and can can be plugged into a standard 15 amp circuit. All electrical components are UL listed.